ChatBox: A Peer to Peer Chat Application. 2.1.1.1 Special thanks to all readers and followers..!! Considering all the requests from users, I am trying to extend the existing simple chat application to the next level and trying to add/accommodate the different change requests or enhancements in this tutorial. Here is the list of all new things that I am going to implement in this tutorial. Chat notification with the count of new messages. Notification sound when a new message comes in from selected and non-selected users. Assign a user-defined name to the user instead of random ID. Display username (My name) at top of online users list and as document title. Improved User experience by changing some CSS properties. Improved chatBox messages UI. In this tutorial, you will learn how to create a Peer to Peer chat application using Node.js and Socket.IO. Let’s get started with the advanced level of the chat application, and I hope you will find it easy and useful to learn and implement. I assume you all are now familiar with Node.js, Express.js, and Socket.IO and if not then refer my previous tutorial for more details. So I am skipping the details how to install and use Node Server, Node.js, NPM, Express.js, and Socket.IO. Note: I am using Linux machine, so you may face difficulties following steps in case you are using a different operating system. Let’s create a folder/directory called chat-application to hold our application files. Now open NodeJS command prompt/terminal and navigate to your application directory i.e. chat-application. Create a jsonfile which is the manifest file that describes our project. Install Express, HTTP, socket.io and path npm modules in your working directory i.e. chat-application. To install all these npm modules/packages/dependencies execute below command. The above command will result in below screen, you can see all the dependencies mentioned in package.json are installed in node_modules directory. Now create a HTML file i.e. html which is used to serve the chat window in a browser. I have seen may people complaining about my previous application that it’s not working. Please make sure you reference to the correct/compatible versions of the JQuery and Socket.io (client) and server (node) versions. The whole page is divided into 2 parts i.e onlineUsersContainer and onlineUsersContainer. onlineUsersContainer holds the list of online users and onlineUsersContainer holds the chatBox, span to notify typing, textbox to type a message and a send button to send a message. Now create a css file i.e. cssto have a better user experience. Put below css properties in style.css and save it. Now create index.js file to set up our application server. This will be your server-side node.js script file used to serve the request from all connected clients. Third block registers events on socket connection. Each even is described in detail below. connection: Sent by all clients when they establish the connection with server. chatMessage: Sent by a connected client on click of send button. This event is listened by server and emits another chatMessage event to the recipient client. This is peer to peer communication. notifyTyping: Sent by a connected client onKeyup even of textbox and emits another notifyTyping event to the recipient client. This is peer to peer communication. newUser: Sent by a connected client on page load to notify server that the client is connected with name say Sandip Salunke. Server then push this new user to the list of online users and emit another newUser to notify all other connected clients that the new user is connected. Server will also emit onlineUsers event to send the updated list of online users to all connected clients. This is broadcast communication. disconnect: Sent by connected client when user disconnects/leaves the chatBox. Server then removes the user from the list of online users and emit onlineUsers event to send the updated list of online users to all connected clients. Server will also emit a userDisconnected event to all connected clients to notify that the user is disconnected. This is broadcast communication. allChatMessages array is used to hold all the messages sent/received to/from my friends. chatNotificationCount array is used to hold the count of unread messages from my friends. myUser and myFriend arrays are used to hold users information and selected friend’s information respectively. // and the same is used to send peer message. On page load i.e document.ready() call loginMe() function which will then ask user for his/her name and then on submission emits a newUser event to the server. On form submit get the value of input box, push the chat message in allChatMessages array and then emits a chatMessage event along with message object. On keypress event of input box emit the notifyUser to the server along with name of user to display “Sandip Salunke is typing…” message to the user. loadChatbox() function is called when user selects a friend from the list of online users. This function is used to load all chat message (chat history) sent/received to/from that selected friend. appendCatMessage() function is called when a new message arrives from my friend. This function is called to append a new message to the selected chatBox. The new message received is also pushed into the allChatMessages array to maintain the history. An audio notification sound is also played on arrival of new message. This function also updates the chatNotification count if the user is inactive/not selected. playNewMessageAudio() function is used to play notification sound when a new message received for active friend. playNewMessageNotificationAudio() function is used to play notification sound when a new message received for inactive friend. updateChatNotificationCount() function is used to maintain the count of unread messages for inactive friends and updates the same on UI when new message comes in. clearChatNotificationCount() function is used to clear count of unread messages when user clicks on friend (or begins chat with friend) from the list of online users. selectUserChatBox() function is called when user selects a friend from the list of online users. This function activates the chatBox, load chat history and clears the notification count. newUser: This event listener receives the details (name, id) of user and assigns the same to the myUser array. The reason behind sending same events back and forth from client and server is that the name of the user is collected by client and the unique ID (socket Id) is assigned by server. In order to sync both the values at client as well as server and establish a initial connection we have to send these events back and forth. notifyTyping: This event listener notifies the user that his/her friend is typing a message. onlineUsers: This event listener build the list of online users and activates my friend’s chatBox by default if there is only one. chatMessage: This event listener receives the new chat message from friends and append it to the chatbox. All set, now it’s time to run the server to see how it works. Now go to your node command prompt and run the application with the following command. The above command will result in below screen, enter your name and hit ok then you are allow to enter the chatBox. Note: If you don’t provide a name it will not allow you to enter the chatBox. Now go to your favorite web browser and open link (localhost:3000) in two different windows. Here we go, enjoy the chatBox.!! I Hope you have enjoyed this tutorial and find it easy to learn, implement and use. I have written this tutorial based on my experience and knowledge. There might be some glitches present in this tutorial, please bear with me and let me know if you find any problem. Any suggestions/improvements in this tutorial are welcome. Thanks! Special thanks to all readers and followers..!! I am an IT Professional with 7 Yrs of experience, skills and enormous interest in Software Architecture and Development. 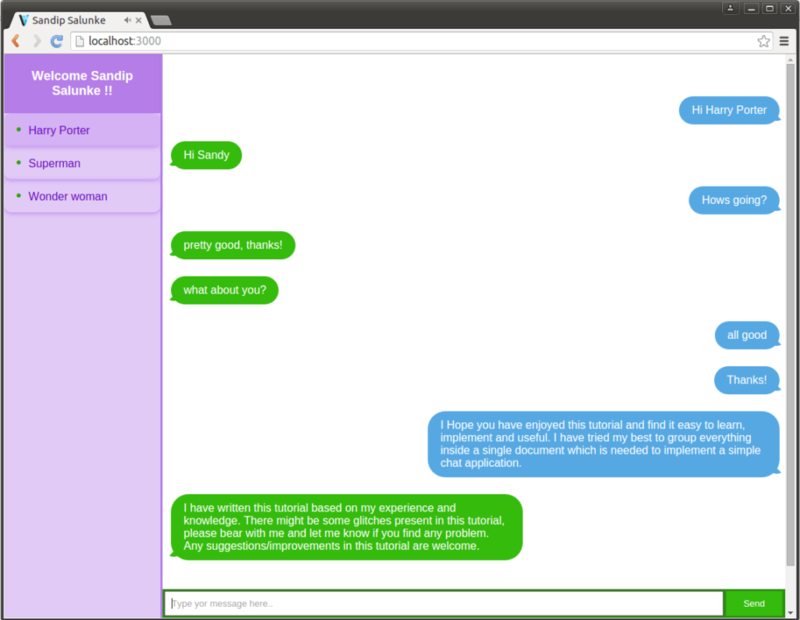 12 Comments → ChatBox: A Peer to Peer Chat Application. very interesting and helpful tutorial. Waiting for your next version!! All the best! Sure, Nice to know you are interested to make it better. Please do let me know what you are thinking with all possible details (Technical). This is pretty simple to learn and so easy to implement. That was awesome! Thanks alot! Hi Sandip. Thank you for the generosity of sharing your knowledge. Can we implement this and some ideas I have together? Sent you an email already. Many thanks in advance. Ringa is on Google Play, but we are building a completely new Ringa 2.0.